I am a physiotherapist and the co-founder of healthSwapp, which is like YouTube for home exercise prescription. Outside of my clinical work and my company, I’m a swimmer, rock climber and backcountry camper. Over the past year and a half of building my company, I‘ve come to realize that many of the lessons I’ve learned building a business have been similar to what I’ve learned in the woods. Just like hiking, starting a business is a process that requires planning, passion and a deep understanding of the terrain. Here are the top five lessons that I’ve learned so far. When I was climbing Kilimanjaro, my Tanzanian guides kept telling us enthusiastic Canadian hikers “Mizungo. Pole. Pole.” – meaning “White girl. Slowly. Slowly.” Our guides were trying to help us acclimatize to the escalating altitude slowly and safely, to allow our bodies time to adjust to the thinning oxygen. On the first two days we didn’t listen, but by day three, we slowly followed in their footsteps. Similarly, when my co-founder and I started healthSwapp, we moved as quickly as we could to get our software and service out on the market. However, as we started to test the app with a group of you (practitioners), we realized that health care and technology are different atmospheres. Like our Tanzanian guides, practitioners knew the best speed to slowly and surely move forwards. In life, in business, in clinical practice and in backcountry navigation, there will be times that you don’t get it right the first time – and that’s okay. On a backcountry hike in Newfoundland, I learned this lesson the hard way. A self-taught, amateur navigator, I set out on the long range traverse with a friend. Neither of us had any experience on a backcountry, trail-free route. This five-day hike would take us up a gorge, across the traverse and finally, over the Gross Morne Mountain. Amazingly, we passed the qualifying test that gave us access to the hike. So, off we travelled to the trailhead, which is nestled in between the high gorges and accessible only by boat. To the confusion of many of the tourists on board, my friend and I hopped off the boat with the gear on our back and animal hats on our heads, determined to orient ourselves through the woods of Newfoundland. Our biggest mistake was not understanding how different Newfoundland’s woods are from Ontario’s. We soon learned that a compass is only as good as the person who holds it. The same concept applies in business. Understanding our terrain (market), our orientation (where we fit in), and the level of our “supplies” (energy levels), was crucial to the development and growth of healthSwapp. Our initial business model required physiotherapists to charge their patients for the use of the app. Our hypothesis: Patients will be more likely to do their home program if they’ve invested in it. Reality: Currently, not all physiotherapists want to charge their patients additional fees and therefore, our model failed. We spent several months trying out this first model, often lost and unable to navigate the complexities of this approach. But when we re-evaluated our environment, we were able to make the decision to change our model. We pivoted to a subscription fee for practitioners and saw healthSwapp begin to grow. On that hike in Newfoundland, my friend and I quickly realized that we needed another teammate – either someone who had experience with backcountry map and compass navigation, or a GPS. Bringing a GPS had been an option that we chose not to take. If we hadn’t been so ambitious in wanting to do the hike without technology or help, we might have ended up on the right side of the gorge. Building a team who shares in a cohesive vision, meshes well, has passion, and complimentary skillsets has been critical for meeting the challenges of building a business. 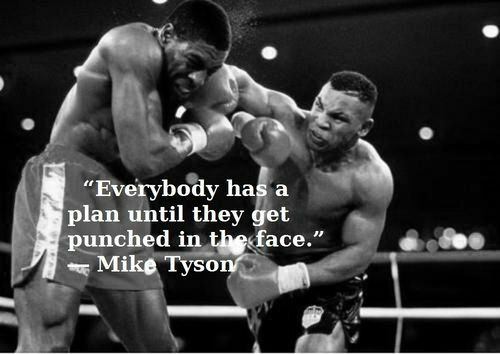 As boxer Mike Tyson says “Everyone has a plan until they get punched in the face.” So much about healthSwapp’s ability to get back up after being figuratively “punched” comes from our teamwork and support for each other. Our quick recoveries have also been possible by having a great group of coaches and cheerleaders in our corner. Being accepted into the DMZ – the top university business incubator in North America – has helped us build up our team members and coaches. There we have access to co-working space, advisors, business services, education and most importantly, other startups. Don’t bail on the trail. Having big, audacious goals is important. But learning how to create a framework for achieving these goals, taking them one step at a time and sticking with it has been crucial. It is easy to get taken off course by shiny objects and end up in pits that absorb time, resources, and energy. If what you’re doing doesn’t contribute to your goals, then you need to rethink what you’re doing. While building healthSwapp, it has been important to find our path and stick with it, no matter how challenging the terrain becomes or what else gets thrown our way. Death stink and leaky water bottles. Death stink; that slight but noticeable sense that something’s definitely not right. Don’t ignore it; it only gets worse. Aas physiotherapists, we take so many courses and are constantly seeking new knowledge in order to improve patient care. But, if we aren’t able to transfer this knowledge to our patients efficiently and effectively, then this knowledge becomes obsolete. Just like pouring water into a leaky bottle, a significant amount of the knowledge we transfer to our patients is often lost due to our outdated methods of communication. Currently, we don’t know what our patients do when they leave the clinic, and we know that our clinical sessions are just the tip of the iceberg. If our patients don’t understand or follow our instructions, chances are our efforts in clinic will have minimal effect on improving their condition. I believe that technology can bridge this gap by changing the way that we communicate and follow-up with our patients. By giving patients convenient access to their physiotherapy programs from their practitioner and the opportunity to track how much they’ve done, we can become even more powerful allies in their recovery. Building the technology and demonstrating that it can improve patient outcomes is the first step. The process of incorporating it successfully into our practices in a way that both compliments our treatment and improves our workflow is a much larger mountain to climb. This potential future for our profession is how I’ve kept my passion for physiotherapy. I’m on a mission to bring innovation and technology to the profession that I love. Whether it’s physiotherapy or camping, I believe that I should leave everything a little bit better than how I found it. Maggie Bergeron is a registered physiotherapist and co-founder of healthSwapp. Over the last year of building and growing healthSwapp Maggie has been challenged and stretched outside of her comfort zone. Through her experiences in the startup world she has found a new passion for her profession and has learned to incoporate aspects of other professions, such as technology, marketing, sales and business development, into physiotherapy. Very nice, encouraging article. Great to incorporate technology. I love the analogies! I strongly agree that we take so many courses over the years but it's being able to put this knowledge into practice to help our patients that is the key. It great that you have found your passion!